Battlestar is a competent PC version of popular Battleship board game -- no more, no less. 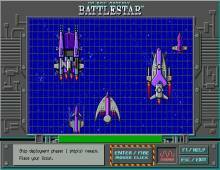 The game replaces the ships with nice-looking spaceships, but otherwise the gameplay remains identical: try to correctly guess the locations of the opposite player's five spaceships before your ships are discovered and destroyed. You can play against the computer or another human player, and the computer's AI is not half bad. Overall, if you like the board game, Battlestar is worth a look. If you want something based on the same idea but with more challenging twists, though, try Fathom It! (reviewed on this site) instead.